Three polarized outlets in a solid molded plug for convenient use indoors. Includes an attached safety cover for unused outlets. 13 amp/125 volt/1625 watts. UL, cULus Listed for indoor use only. Rated for 300 volt, grounded. Manufactured with copper conductors and solid molded plugs and two layers of insulation, one around each conductor and a second outer jacket that won't mark floors or walls and resists deterioration from moisture and abrasion. UL, cULus Listed, meets OSHA specifications. Sleeved. Three polarized outlets in a solid molded plug for convenient use indoors. Includes an attached safety cover for unused outlets. 13 amp/125 volt/1625 watts. UL, cULus Listed for indoor use only. 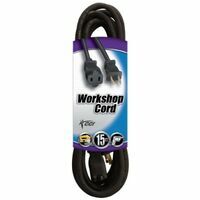 Replacement cord for non-polarized irons and appliances. 15 amp/125 volt. Sleeved. Designed for easy use on appliances, power tools, lamps, water coolers, air conditioners, dryers, ranges and garbage disposals. Includes instructions for replacing worn or damaged cords. 2-conductor, 1-1/4" tool end slit, insulation stripped 3/8". 16/2 SJTW, 13 amp/125 volt. Sleeved. For air conditioners. Features heavy-duty vinyl insulation and right angle plugs. 15 amp/125 volt. UL, cULus Listed. Sleeved. Fits all kitchen appliances using 11/16" spacing between contacts such as waffle irons, grills, and bottle warmers. 10 amp/125 volt. UL Listed. Sleeved. Low profile, right angle, molded-on plug, 1/2" insulation strip with twisted and tip-tinned ends. cULus Listed. Sleeved. 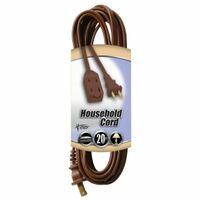 Indoor only, household cord. Thin male plug keeps cord close to wall. Plug does not block other outlets. White, 13 amp/125 volt. UL Listed. Sleeved. Made of stranded and cabled copper conductors and solid molded plugs for longer life. Orange outer jacket won't mark floors or walls. Resists deterioration from moisture and abrasion and has a 300 volt rating. UL Listed. Sleeved. Solid molded power taps and three outlets in a compact design. Features solid molded plugs and stranded all-copper conductors. Made with tough vinyl insulation that won't mark walls or floors and resists deterioration from moisture and abrasion. 15 amp/125 volt. Sleeved. For use with pin-type construction such as mixers, electric knives, warming trays and calculators using 5/16" spacing between contacts. 6 amp/125 volt. cUL Listed. Sleeved. Three polarized outlets in a molded plug for convenient use indoors. Includes an attached safety cover for unused outlets. 13 amp/125 volt. UL Listed. Three weather resistant outlets. 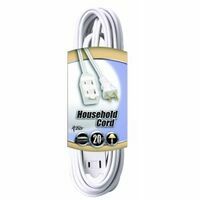 Unit stores 150' of 16/3 extension cord neatly and conveniently, has a comfortable handle and ergonomic features for ease of handling. Three polarized outlets in a molded plug for convenient use indoors. Includes an attached safety cover for unused outlets. 13 amp/125 volt. UL Listed. Polarized for heat-producing appliances. 15 amp/125 volt. Sleeved. Designed for use on appliances and power tools that use up to 13 amp/125 volt/1625 watts. Includes instructions on replacing worn or broken cords. 16/3 SJTW. UL, cULus Listed. Contractor cord with lighted end. 15 amp/125 volt/1875 watts. Oil resistant, water resistant, flame retardant. Stays flexible down to -58 degrees Fahrenheit, stands up to 221 degrees Fahrenheit. UL, cULus Listed and CSA Certified. Meets OSHA requirements for outdoor use. Sleeved. Ultra thin 1/2" thick plug converts one outlet into three. Includes safety covers for unused outlets. UL, cULus Listed for indoor use only. For air conditioners. Features heavy-duty vinyl insulation and right angle plugs. 15 amp/125 volt. UL, cULus Listed. Sleeved. Holiday 9' 3-outlet cord with footswitch. Ultra thin 1/2" thick plug converts one outlet into three. Includes safety covers for unused outlets. UL, cULus Listed for indoor use only. Rated for 300 volt, grounded. Manufactured with copper conductors and solid molded plugs and two layers of insulation, one around each conductor and a second outer jacket that won't mark floors or walls and resists deterioration from moisture and abrasion. UL, cULus Listed, meets OSHA specifications. Sleeved. Three outlet adapters with high gloss, extra durable, super flexible wire. Solid molded power block head stands up to heat, cold and rough use. 15 amp/125 volt insulated wire. Meets OSHA standards, UL Listed. Yellow. Sleeved. Use to protect cords and reduce tripping hazard while keeping floor areas clean and safe. Durable, 14/32" height, low-profile, and flexible to conform to any floor surface. Easy to install, cuts to length. 1/2" opening hides many power and data cords. Solid molded power taps, the convenience of 3 outlets in a compact design. Sleeved. Medium duty, 16/3 SJT. Indicator light in the female end connector shows when the power is on. Cord stays flexible down to -58 degrees, stands up to 140 degrees Fahrenheit. Water, flame and abrasion resistant. Molded-on plug and connector with heavy-duty strain relief. cULus listed. Blue. Sleeved. Three weather resistant outlets. Right angle male cap, 1-1/4" appliance end slit and 3/8" insulation stripped. Includes instructions for replacing worn or damaged cords. 13 amp/125 volt. Converts a Twist-To-Lock 20 amp receptacle to an outlet that accepts 15 amp male plugs. Stranded copper conductors, bright yellow jacket and solid molded plugs for longer life. Not Yellow Jacket compound. Double-thick 600 volt insulation. UL Listed, Meets OSHA Specifications. Converts a standard 15 amp grounded receptacle to a locking 20 amp. receptacle. Stranded copper conductors, bright yellow jacket and solid molded plugs for longer life. Not Yellow Jacket compound. Double-thick 600 volt insulation. UL Listed, meets OSHA specifications. Plastic cord storage reel. ABS knob to reel in cord. Holds up to 100 feet of 16/AWG cord. Solid molded 3 outlet plug. AWG 12/3 STW. For tools that use up to 15 amp/125 volt/1875 watts. Meets OSHA standards. UL, cULus Listed. Sleeved. Power supply replacement cord with strain relief. Includes instructions for replacing worn or damaged cords. 30 amp/250 volt. UL, cULus Listed. Sleeved. Manufactured with stranded and cabled copper conductors and solid molded plugs for longer life. Outer jacket wont mark floors or walls. SJTW cords resist deterioration from moisture and abrasion. 300 volt wire rating. Sleeved. Solid molded power taps, the convenience of 3 outlets in a compact design. Sleeved. Indoor only, household cord. Thin male plug keeps cord close to wall. Plug does not block other outlets. White, 13 amp/125 volt. UL Listed. Sleeved. Safety cord monitors and senses excessive heat in outlets and plugs. When excessive heat is detected an audible alarm is sounded and a warning light is illuminated alerting about a possible issue before it becomes dangerous. Self-test button is on each end of the cord to test alerts. Safety shutters stop access to unused outlets. Safety cord monitors and senses excessive heat in outlets and plugs. When excessive heat is detected an audible alarm is sounded and a warning light is illuminated alerting about a possible issue before it becomes dangerous. Self-test button is on each end of the cord to test alerts. Safety shutters stop access to unused outlets. Handle driven plastic cord storage reel. Easy carry handle. With stand. Holds up to 100 feet of cord. Use to protect cords and reduce tripping hazard while keeping floor areas clean and safe. Durable, 14/32" height, low-profile, and flexible to conform to any floor surface. Easy to install, cuts to length. 1/2" opening hides many power and data cords. Use to protect cords and reduce tripping hazard while keeping floor areas clean and safe. Durable, 14/32" height, low-profile, and flexible to conform to any floor surface. Easy to install, cuts to length. 1/2" opening hides many power and data cords. Solid molded power taps, the convenience of 3 outlets in a compact design. Sleeved. Indicator light in the female end connector shows when the power is on. Cord stays flexible down to -58 degrees, stands up to 140 degrees Fahrenheit. Water, flame and abrasion resistant. Molded-on plug and connector with heavy-duty strain relief. cULus listed. Blue. Sleeved. Made of stranded and cabled copper conductors and solid molded plugs for longer life. Orange outer jacket won't mark floors or walls. Resists deterioration from moisture and abrasion and has a 300 volt rating. UL Listed. Sleeved. Rated for 300 volt, grounded. Manufactured with copper conductors and solid molded plugs and two layers of insulation, one around each conductor and a second outer jacket that won't mark floors or walls and resists deterioration from moisture and abrasion. UL, cULus Listed, meets OSHA specifications. Sleeved. For air conditioners. Features heavy-duty vinyl insulation and right angle plugs. 15 amp/125 volt. UL, cULus Listed. Sleeved. Water resistant and flame retardant. Ultra flexible in temperatures down to -40 degrees F and stands up to +140 degrees F. Oversized plugs. Strain relief prevents wire from separating from the plugs. cULus Listed. Sleeved. Safety cord monitors and senses excessive heat in outlets and plugs. When excessive heat is detected an audible alarm is sounded and a warning light is illuminated alerting about a possible issue before it becomes dangerous. Self-test button is on each end of the cord to test alerts. Safety shutters stop access to unused outlets. 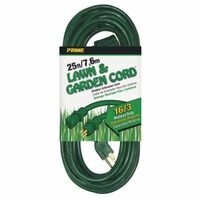 Prime Extension Cord, 16/3 AWG Conductor, 25 ft Length, 13 A, 125 VAC, Green Jacket Manufactured with a polarized outlet in a molded plug for convenient use indoors. Remote on/off switch for easy power control. 13 amp/125 volt. Sleeved. Solid molded power taps, the convenience of 3 outlets in a compact design. Sleeved. For air conditioners. Features heavy-duty vinyl insulation and right angle plugs. 15 amp/125 volt. UL, cULus Listed. Sleeved. Power supply replacement cord with strain relief. Includes instructions for replacing worn or damaged cords. 30 amp/250 volt. UL, cULus Listed. Sleeved. Solid molded 3 outlet plugs. For tools that use up to 15 amp. Meets OSHA standards. UL Listed. Indoor and outdoor locking 20 amp plug, NEMA L5-20P with lighted 15 amp NEMA 5-15R triple-tap receptacle. 12 gauge wire. Stranded conductors, bright yellow jacket and solid molded plugs. UL Listed. Handle driven cord storage reel with metal stand. Holds up to 100 feet of 16/AWG cord. Power supply replacement cord with strain relief. Includes instructions for replacing worn or damaged cords. 30 amp/250 volt. UL, cULus Listed. Sleeved. Water resistant and flame retardant. Ultra flexible in temperatures down to -40 degrees F and stands up to +140 degrees F. Strain relief prevents wire from separating from the plug. 13 amp/125 volt/1625 watts. cULus Listed. Sleeved. Heavy duty, 14/3. Meets OSHA specifications. UL, cULus Listed for outdoor use. 125 volts. Features heavy-duty vinyl insulation and a right angle plug. 12 gauge 3 wire, used for 20 amp appliances such as air conditioners or refrigerators. 20 amp/250 volt. UL Listed. Sleeved. Designed for general purpose indoor use. Features solid molded plugs and stranded all-copper conductors. Made of tough vinyl insulation that won't mark walls or floors and resists deterioration from moisture and abrasion. Yellow, sleeved. Rental. Meets OSHA specifications. UL, cULus Listed for outdoor use. Beige, sleeved. Indicator light in the female end connector shows when the power is on. Cord stays flexible down to -58 degrees, stands up to 140 degrees Fahrenheit. Water, flame and abrasion resistant. Molded-on plug and connector with heavy-duty strain relief. cULus listed. Blue. Sleeved. CCI Extension Cord, Ultra Flexible, 16/2 AWG Conductor, 15 ft Length, 13 A, 125 VAC, Thermoset Jacket, Black Jacket, UL Listed, -40 TO 90 deg C Temperature, For General Indoor/Outdoor Cord for Power Equipment Extra heavy, clear molded plugs are rugged, durable and oversized. Super flexible and abrasion resistant at any temperature. Made to meet OSHA specifications and UL Listed. 'PowerLite' indicator plug glows when the cord has power. 125 volts. Yellow. Sleeved. Power supply replacement cord with strain relief. Includes instructions for replacing worn or damaged cords. 6/2 & 8/1 SRDTUL, 50 amp/250 volt. cULus Listed. Sleeved. Rated for 300 volt, grounded. Manufactured with copper conductors and solid molded plugs and two layers of insulation, one around each conductor and a second outer jacket that won't mark floors or walls and resists deterioration from moisture and abrasion. UL, cULus Listed, meets OSHA specifications. Sleeved. Power supply replacement cord with strain relief. Includes instructions for replacing worn or damaged cords. 30 amp/250 volt. UL, cULus Listed. Sleeved. Power supply replacement cord with strain relief. Includes instructions for replacing worn or damaged cords. 30 amp/250 volt. UL, cULus Listed. Sleeved. Designed for use in extreme cold weather environments. Cord will stay flexible down to -58 degrees Fahrenheit. Manufactured with Powerlite plug, female end lights when power is on. UL Listed, meets OSHA specifications. Blue. Sleeved. Indicator light in the female end connector shows when the power is on. Cord stays flexible down to -58 degrees, stands up to 140 degrees Fahrenheit. Water, flame and abrasion resistant. Molded-on plug and connector with heavy-duty strain relief. cULus listed. Blue. Sleeved. Features circuit breaker in the plug, with a reset button. Water resistant, flame retardent, ultra flexible to -40 degrees Fahrenheit. 14/3 SJTW. Red. Sleeved. UL listed, meets OSHA requirements. Grounded outlets. 10 amp circuit breaker. Extra long cord. Rugged impact resistant case. 25 foot 16/3 SJT cord. Power supply replacement cord with strain relief. 4 wire, two 6/2 and two 8/2. Includes instructions for replacing worn or damaged cords. 6/2 & 8/1 SRDT, 50 amp/250 volt. UL, cULus Listed. Sleeved. Extra heavy, clear molded plugs are rugged, durable and oversized. Super flexible and abrasion resistant at any temperature. Made to meet OSHA specifications and UL Listed. 'PowerLite' indicator plug glows when the cord has power. 125 volts. Yellow. Sleeved. Rated for 300 volt, grounded. Manufactured with copper conductors and solid molded plugs and two layers of insulation, one around each conductor and a second outer jacket that won't mark floors or walls and resists deterioration from moisture and abrasion. UL, cULus Listed, meets OSHA specifications. Sleeved. Power supply replacement cord with strain relief. Includes instructions for replacing worn or damaged cords. 6/2 & 8/1 SRDTUL, 50 amp/250 volt. cULus Listed. Sleeved. Made of stranded and cabled copper conductors and solid molded plugs for longer life. Orange outer jacket won't mark floors or walls. Resists deterioration from moisture and abrasion and has a 300 volt rating. UL Listed. Sleeved. Solid molded plugs and stranded all-copper conductors. Made with tough vinyl insulation that won't mark walls or floors and resists deterioration from moisture and abrasion. 13 amp/125 volt. Sleeved. Indoor and outdoor locking 20 amp plug, NEMA L5-20R with two locking 20 amp NEMA L5-20R receptacles. 12 gauge wire. Stranded conductors, bright yellow jacket and solid molded plugs. Not Yellow Jacket compound. UL Listed. Designed for general purpose indoor use. Features solid molded plugs and stranded all-copper conductors. Made of tough vinyl insulation that won't mark walls or floors and resists deterioration from moisture and abrasion. Yellow, sleeved. Rental. Designed for hard usage. Large cap and connector, thick flexible vinyl jacket, three conductor, lighted end to show when power is on. Store indoors when not in use. 15 amp/125 volt/1875 watts. Yellow. Sleeved. UL Listed, meets OSHA specifications. Designed for use in extreme cold weather environments. Cord will stay flexible down to -58 degrees Fahrenheit. Manufactured with Powerlite plug, female end lights when power is on. UL Listed, meets OSHA specifications. Blue. Sleeved. Rated for 300 volt, grounded. Manufactured with copper conductors and solid molded plugs and two layers of insulation, one around each conductor and a second outer jacket that won't mark floors or walls and resists deterioration from moisture and abrasion. UL, cULus Listed, meets OSHA specifications. Sleeved. Power supply replacement cord with strain relief. 4 wire, two 6/2 and two 8/2. Includes instructions for replacing worn or damaged cords. 6/2 & 8/1 SRDT, 50 amp/250 volt. UL, cULus Listed. Sleeved. Designed for use in extreme cold weather environments. Cord will stay flexible down to -58 degrees Fahrenheit. Manufactured with Powerlite plug, female end lights when power is on. UL Listed, meets OSHA specifications. Blue. Sleeved. Extra heavy, clear molded plugs are rugged, durable and oversized. Super flexible and abrasion resistant at any temperature. Made to meet OSHA specifications and UL Listed. 'PowerLite' indicator plug glows when the cord has power. 125 volts. Yellow. Sleeved. Molded-on and bonded vinyl female connector and mechanical GFCI male plug. 3 conductor SJTW 2' cord, triple tap. Contractor cord with lighted locking connector. Oil resistant, water resistant, flame retardant. Stays flexible down to -58 degrees Fahrenheit, stands up to 221 degrees Fahrenheit. UL, cULus Listed and CSA Certified. Meets OSHA requirements for outdoor use. Nema 5-15 plug. Yellow. Boxed. Extreme temperature cord with lighted locking connector. Blue with orange stripe for visibility. Oil resistant, water resistant, flame retardant. Stays flexible down to -58 degrees Fahrenheit, stands up to 221 degrees Fahrenheit. 30 percent lighter than standard rubber cords. UL, cULus Listed and CSA Certified. Meets OSHA requirements for outdoor use. Sleeved. Rated for 300 volt, grounded. Manufactured with copper conductors and solid molded plugs and two layers of insulation, one around each conductor and a second outer jacket that won't mark floors or walls and resists deterioration from moisture and abrasion. UL, cULus Listed, meets OSHA specifications. Sleeved. Meets OSHA specifications. UL, cULus Listed for outdoor use. 125 volts. Black SJTOW wire type, oil-resistant, stands up to common farm, ranch and industrial chemicals. Designed specifically for farm environments, will not absorb oil, become brittle and swell like regular SJT cords, remains flexible in all temperatures. 125 volt, 15 amp, UL listed. Sleeved. Power indicator light allows you to see when the cord has power. Ultra-flexible down to -58 degrees F/-50 degrees C. Flame retardant - protects against accidental cord fire. Water resistant - will not absorb water that can corrode copper conductors or cause dangerous electrical shocks. Nickel coated brass blades resist corrosion. 12/3 SJTW, 25', extra heavy duty. Indicator light in the female end connector shows when the power is on. Cord stays flexible down to -58 degrees, stands up to 140 degrees Fahrenheit. Water, flame and abrasion resistant. Molded-on plug and connector with heavy-duty strain relief. cULus listed. Blue. Sleeved. Indoor and outdoor locking 20 amp plug with three locking 20 amp NEMA L5-20R receptacles. 12 gauge wire. Stranded conductors, bright yellow jacket and solid molded plugs. Not Yellow Jacket compound. UL Listed. Quickly and easily secures cord for carrying. Shatter and temperature resistant. Holds up to 150 feet of 16/AWG cord. Use to protect cords and reduce tripping hazard while keeping floor areas clean and safe. Durable, 14/32" height, low-profile, and flexible to conform to any floor surface. Easy to install, cuts to length. 1/2" opening hides many power and data cords. Use to protect cords and reduce tripping hazard while keeping floor areas clean and safe. Durable, 14/32" height, low-profile, and flexible to conform to any floor surface. Easy to install, cuts to length. 1/2" opening hides many power and data cords. Solid molded round vinyl powerblock, 3 outlet plugs. Meets OSHA standards. UL Listed. The outer jacket resists deterioration from moisture, abrasion, and extended exposure to sunlight. 300 volt wire rating. Orange. Sleeved. Designed for general purpose indoor use. Features solid molded plugs and stranded all-copper conductors. Made of tough vinyl insulation that won't mark walls or floors and resists deterioration from moisture and abrasion. Yellow, sleeved. Rental. Water resistant and flame retardant. Ultra flexible in temperatures down to -40 degrees F and stands up to +140 degrees F. Strain relief prevents wire from separating from the plug. 15 amp/125 volt/1875 watts. cULus Listed. Sleeved. High visibility red. Wiremold Cord Guard, Light Duty, 2-1/2 in Width, 15 ft Length, Rubber, Gray, Floor Mount, 7/16 in Capacity Black SJTOW wire type, oil-resistant, stands up to common farm, ranch and industrial chemicals. Designed specifically for farm environments, will not absorb oil, become brittle and swell like regular SJT cords, remains flexible in all temperatures. 125 volt, 15 amp, UL listed. Sleeved. Made of stranded and cabled copper conductors and solid molded plugs for longer life. Orange outer jacket won't mark floors or walls. Resists deterioration from moisture and abrasion and has a 300 volt rating. UL Listed. Sleeved. Extreme temperature cord with lighted locking connector. Blue with orange stripe for visibility. Oil resistant, water resistant, flame retardant. Stays flexible down to -58 degrees Fahrenheit, stands up to 221 degrees Fahrenheit. 30 percent lighter than standard rubber cords. UL, cULus Listed and CSA Certified. Meets OSHA requirements for outdoor use. Sleeved. Features circuit breaker in the plug, with a reset button. Water resistant, flame retardent, ultra flexible to -40 degrees Fahrenheit. 14/3 SJTW. Red. Sleeved. UL listed, meets OSHA requirements. Heavy-duty ultra flexible rubber, oil and chemical resistant. Use at construction sites and for other heavy-duty uses. Retains flexibility in low temperatures. Triple tap extension cord with power indicator light. 3 conductor SJTW, features molded-on and bonded vinyl plugs and connectors, in-line mechanical GFCI centrally placed along the cord, and test and reset buttons. 12/3 SJTW 3' cord, 15 amp, 1875 watt. Contractor cord with lighted locking connector. Oil resistant, water resistant, flame retardant. Stays flexible down to -58 degrees Fahrenheit, stands up to 221 degrees Fahrenheit. UL, cULus Listed and CSA Certified. Meets OSHA requirements for outdoor use. Nema 5-15 plug. Yellow. Boxed. Power indicator light, oil and water resistant, flame retardant. Flexible to -58 degrees F. NEMA 5-15, cULus Listed, meets OSHA specifications. 12/3 - 15 amp. Indicator light in the female end connector shows when the power is on. Cord stays flexible down to -58 degrees, stands up to 140 degrees Fahrenheit. Water, flame and abrasion resistant. Molded-on plug and connector with heavy-duty strain relief. cULus listed. Blue. Sleeved. Contractor cord with lighted locking connector. Oil resistant, water resistant, flame retardant. Stays flexible down to -58 degrees Fahrenheit, stands up to 221 degrees Fahrenheit. UL, cULus Listed and CSA Certified. Meets OSHA requirements for outdoor use. Nema 5-15 plug. Yellow. Boxed. Designed for hard usage. Large cap and connector, thick flexible vinyl jacket, three conductor, lighted end to show when power is on. Store indoors when not in use. 15 amp/125 volt/1875 watts. Yellow. Sleeved. UL Listed, meets OSHA specifications. Designed for use in extreme cold weather environments. Cord will stay flexible down to -58 degrees Fahrenheit. Manufactured with Powerlite plug, female end lights when power is on. UL Listed, meets OSHA specifications. Blue. Sleeved. Portable duplex outlet junction box. 6 foot 12/3 SJTW water resistant and flame retardant cord. Heavy duty plastic case with hinged cover to protect the outlets from the elements. Has a hanging slot on the back of the housing to hang on a screw head. Durable conductor blades and ground pin to prevent break-off or pull-out. Power on/off indicator light, GFCI reset and test buttons and circuit breaker reset button. Designed for use in extreme cold weather environments. Cord will stay flexible down to -58 degrees Fahrenheit. Manufactured with Powerlite plug, female end lights when power is on. UL Listed, meets OSHA specifications. Blue. Sleeved. Rated for 300 volt, grounded. Manufactured with copper conductors and solid molded plugs and two layers of insulation, one around each conductor and a second outer jacket that won't mark floors or walls and resists deterioration from moisture and abrasion. UL, cULus Listed, meets OSHA specifications. Sleeved. GFI protected 2' 12/3 SJTW power block cord with in-line GFCI, converts 1 outlet into 3 GFCI protected outlets. Light indicates when the power is on. 15 amp/120 volt/ 1800 watt. Meets OSHA specifications. UL listed. Sleeved. Provides maximum safety. Manual test/retest buttons. 'PowerLite' plug glows when the cord has power. Weather resistant for outdoor use. Made to meet OSHA standards. 15 amp, 125 volt. UL Listed. More flexible and abrasion resistant at any temperature than standard vinyl compounds or blue cold weather cords. 3 outlets evenly spaced every 8 feet with high gloss, extra durable, super flexible wire. Light indicates when the cord has power. 15 amp/125 volt. Meets OSHA specifications and UL Listed. Extreme temperature cord with lighted locking connector. Blue with orange stripe for visibility. Oil resistant, water resistant, flame retardant. Stays flexible down to -58 degrees Fahrenheit, stands up to 221 degrees Fahrenheit. 30 percent lighter than standard rubber cords. UL, cULus Listed and CSA Certified. Meets OSHA requirements for outdoor use. Sleeved. Extra heavy, clear molded plugs are rugged, durable and oversized. Super flexible and abrasion resistant. Indicator plug glows when the cord has power. Meets OSHA specifications and UL Listed. Rental. Extra heavy, clear molded plugs are rugged, durable and oversized. Super flexible and abrasion resistant at any temperature. Made to meet OSHA specifications and UL Listed. 'PowerLite' indicator plug glows when the cord has power. 125 volts. Yellow. Sleeved. 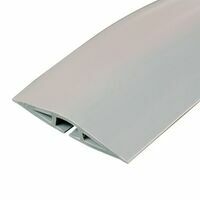 More flexible and abrasion resistant at any temperature than standard vinyl compounds or blue cold weather cords. Three outlets and right angle male plug with ground fault circuit interrupter. Manual test/reset buttons. Yellow, sleeved. Meets OSHA specifications, UL Listed. Solid molded round vinyl powerblock, 3 outlet plugs. Meets OSHA standards. UL Listed. The outer jacket resists deterioration from moisture, abrasion, and extended exposure to sunlight. 300 volt wire rating. Orange. Sleeved. Designed for general purpose indoor use. Features solid molded plugs and stranded all-copper conductors. Made of tough vinyl insulation that won't mark walls or floors and resists deterioration from moisture and abrasion. Yellow, sleeved. Rental. Rated for 300 volt, grounded. Manufactured with copper conductors and solid molded plugs and two layers of insulation, one around each conductor and a second outer jacket that won't mark floors or walls and resists deterioration from moisture and abrasion. UL, cULus Listed, meets OSHA specifications. Sleeved. Durable GFIC protected power station features four protected outlets. Flexible outlet covers keep dust and debris out of outlets. Rated 15 amp/125 volt/1875 watts. Meets OSHA standards. 14/3 SJTW 6' yellow cord. Boxed. UL Listed. Rental. Indicator light in the female end connector shows when the power is on. Cord stays flexible down to -58 degrees, stands up to 140 degrees Fahrenheit. Water, flame and abrasion resistant. Molded-on plug and connector with heavy-duty strain relief. cULus listed. Blue. Sleeved. Locking plug keeps tools plugged in. Works with any tool. Abrasion resistant and flexible. Yellow, 15 amp/125 volts. UL Listed. Has right angle male plug ground fault circuit interrupter. 'Power Lite' female plug glows when the cord has power. Manual test/reset buttons. 15 amp, 125 volt. Meets OSHA standards, UL Listed. Extreme temperature cord with lighted locking connector. Blue with orange stripe for visibility. Oil resistant, water resistant, flame retardant. Stays flexible down to -58 degrees Fahrenheit, stands up to 221 degrees Fahrenheit. 30 percent lighter than standard rubber cords. UL, cULus Listed and CSA Certified. Meets OSHA requirements for outdoor use. Sleeved. Extreme temperature cord with lighted locking connector. Blue with orange stripe for visibility. Oil resistant, water resistant, flame retardant. Stays flexible down to -58 degrees Fahrenheit, stands up to 221 degrees Fahrenheit. 30 percent lighter than standard rubber cords. UL, cULus Listed and CSA Certified. Meets OSHA requirements for outdoor use. Sleeved. Meets OSHA specifications. UL, cULus Listed for outdoor use. 125 volts. Meets OSHA specifications. UL, cULus Listed for outdoor use. 125 volts. Features circuit breaker in the plug, with a reset button. Water resistant, flame retardent, ultra flexible to -40 degrees Fahrenheit. 14/3 SJTW. Red. Sleeved. UL listed, meets OSHA requirements. Extra heavy, clear molded plugs are rugged, durable and oversized. Super flexible and abrasion resistant. Indicator plug glows when the cord has power. Meets OSHA specifications and UL Listed. Rental. Solid molded round vinyl powerblock, 3 outlet plugs. Meets OSHA standards. UL Listed. The outer jacket resists deterioration from moisture, abrasion, and extended exposure to sunlight. 300 volt wire rating. Orange. Sleeved. Solid molded round vinyl powerblock, 3 outlet plugs. Meets OSHA standards. UL Listed. The outer jacket resists deterioration from moisture, abrasion, and extended exposure to sunlight. 300 volt wire rating. Orange. Sleeved. Contractor cord with lighted locking connector. Oil resistant, water resistant, flame retardant. Stays flexible down to -58 degrees Fahrenheit, stands up to 221 degrees Fahrenheit. UL, cULus Listed and CSA Certified. Meets OSHA requirements for outdoor use. Nema 5-15 plug. Yellow. Boxed. Three outlet adapters with high gloss, extra durable, super flexible wire. Solid molded power block head stands up to heat, cold and rough use. 15 amp/125 volt insulated wire. Meets OSHA standards, UL Listed. Yellow. Sleeved. Designed for hard usage. Large cap and connector, thick flexible vinyl jacket, three conductor, lighted end to show when power is on. Store indoors when not in use. 15 amp/125 volt/1875 watts. Yellow. Sleeved. UL Listed, meets OSHA specifications. Contractor cord with lighted locking connector. Oil resistant, water resistant, flame retardant. Stays flexible down to -58 degrees Fahrenheit, stands up to 221 degrees Fahrenheit. UL, cULus Listed and CSA Certified. Meets OSHA requirements for outdoor use. Nema 5-15 plug. Yellow. Boxed. Extra heavy, clear molded plugs are rugged, durable and oversized. Super flexible and abrasion resistant. Indicator plug glows when the cord has power. Meets OSHA specifications and UL Listed. Rental. Contractor cord with lighted end. Oil resistant, water resistant, flame retardant. Stays flexible down to -58 degrees Fahrenheit, stands up to 221 degrees Fahrenheit.15 amp/125 volt/1875 watts. UL, cULus Listed and CSA Certified. Meets OSHA requirements for outdoor use. Boxed. Twist-to-lock connector. 30 amp, 4 prong. Ultra heavy duty 10/4 STOW wire. Flame retardant. Double jacketed, super abrasion resistant. Used with 30 amp transfer system to store power from generator when AC power to main electrical is lost. Rated for 300 volt, grounded. Manufactured with copper conductors and solid molded plugs and two layers of insulation, one around each conductor and a second outer jacket that won't mark floors or walls and resists deterioration from moisture and abrasion. UL, cULus Listed, meets OSHA specifications. Sleeved. Designed for use in extreme cold weather environments. Cord will stay flexible down to -58 degrees Fahrenheit. Manufactured with Powerlite plug, female end lights when power is on. UL Listed, meets OSHA specifications. Blue. Sleeved. Black SJTOW wire type, oil-resistant, stands up to common farm, ranch and industrial chemicals. Designed specifically for farm environments, will not absorb oil, become brittle and swell like regular SJT cords, remains flexible in all temperatures. 125 volt, 15 amp, UL listed. Sleeved. Indicator light in the female end connector shows when the power is on. Cord stays flexible down to -58 degrees, stands up to 140 degrees Fahrenheit. Water, flame and abrasion resistant. Molded-on plug and connector with heavy-duty strain relief. cULus listed. Blue. Sleeved. Extreme temperature cord with lighted locking connector. Blue with orange stripe for visibility. Oil resistant, water resistant, flame retardant. Stays flexible down to -58 degrees Fahrenheit, stands up to 221 degrees Fahrenheit. 30 percent lighter than standard rubber cords. UL, cULus Listed and CSA Certified. Meets OSHA requirements for outdoor use. Sleeved. TPE rubber provides superior flexibility at sub-freezing temperatures. Resists stiffening or cracking under the most extreme weather conditions. Power indicator light allows you to see when the cord has power. Oil resistant jacket will not deteriorate when used where oil or petroleum products may be present. Flame retardant, protects against accidental cord fire. Water resistant, will not absorb water that can corrode copper conductors or cause dangerous electrical shocks. TPE rubber is 30 percent lighter weight than standard rubber cords. Blue with orange stripe. Ultra heavy duty contractor cord with T-blade and lighted locking connector. Oil resistant, water resistant, flame retardant. Stays flexible down to -58 degrees Fahrenheit, stands up to 221 degrees Fahrenheit. 20 amp/125 volt/2500 watt. UL, cULus Listed and CSA Certified. Meets OSHA requirements for outdoor use. Nema 5-20 plug. Yellow. Boxed. Contractor cord with lighted locking connector. Oil resistant, water resistant, flame retardant. Stays flexible down to -58 degrees Fahrenheit, stands up to 221 degrees Fahrenheit. UL, cULus Listed and CSA Certified. Meets OSHA requirements for outdoor use. Nema 5-15 plug. Yellow. Boxed. Striped high visibility round vinyl cords increase safety and deter theft, features a dominant color and a colored stripe that runs the length of the cord. Plug and connector material is clear PVC, with neon power indicator lamp in the cord connector that shows that the power is on. UL Listed and CSA Certified. Meets OSHA requirements for outdoor use. Locking 20 amp plug, NEMA L5-20P to locking 20 amp NEMA L5-20R receptacle. 12/3 SJTW 12 gauge wire. Stranded conductors, bright yellow jacket and solid molded plugs. Not Yellow Jacket compound. 20 amp/125 volt. UL Listed. Designed for use in extreme cold weather environments. Cord will stay flexible down to -58 degrees Fahrenheit. Manufactured with Powerlite plug, female end lights when power is on. UL Listed, meets OSHA specifications. Blue. Sleeved. Designed for hard use. Three outlet, large cap and connector, thick, tough, flexible vinyl jacket. Molded connector is moisture resistant. 10/3 SJTW. 15 amp/125 volt/1875 watts. Meets OSHA specifications, UL Listed for outdoor and indoor use. Boxed. T-blade female plug accepts tools with 15 amp, 2 wire, 15 amp, 3 wire and 20 amp, 3 wire plugs. T-blade on female plug only. Meets OSHA standards, UL Listed. Boxed. Contractor cord with lighted locking connector. Oil resistant, water resistant, flame retardant. Stays flexible down to -58 degrees Fahrenheit, stands up to 221 degrees Fahrenheit. UL, cULus Listed and CSA Certified. Meets OSHA requirements for outdoor use. Nema 5-15 plug. Yellow. Boxed. Solid molded round vinyl powerblock, 3 outlet plugs. Meets OSHA standards. UL Listed. The outer jacket resists deterioration from moisture, abrasion, and extended exposure to sunlight. 300 volt wire rating. Orange. Sleeved. Solid molded plug, steel case with hanging hardware. 14/3 SJTW-A, 13 amp/125 volt. Meets OSHA specifications. Manufactured with stranded and cabled copper conductors and solid molded plugs for longer life. Outer jacket wont mark floors or walls. SJTW cords resist deterioration from moisture and abrasion. 300 volt wire rating. Sleeved. Yellow Jacket compound is more flexible and three times more abrasion resistant at any temperature than standard vinyl compounds. Used with portable generators and power transfer switches. 20 amp, 125/250 volt. Twist to lock NEMA L14-20 plug. UL Listed and meets OSHA specifications. Three outlet adapters with high gloss, extra durable, super flexible wire. Solid molded power block head stands up to heat, cold and rough use. 15 amp/125 volt insulated wire. Meets OSHA standards, UL Listed. Yellow. Sleeved. Yellow Jacket compound is more flexible and three times more abrasion resistant at any temperature than standard vinyl compounds or blue cold weather cords. Twist-to-Lock male and female plugs for 30 amp portable generators and power transfer switches. UL Listed, meets OSHA specifications. Outdoor cord, 30 amp, 10 gauge, 4 wire with L14-30 twist lock plug and connector end. Includes an extra 20 amp L14-20 plug end to accommodate most portable generators having L14-20 and L14-30 power outlets. Full-color packaging. UL Listed. Contractor cord with lighted locking connector. Oil resistant, water resistant, flame retardant. Stays flexible down to -58 degrees Fahrenheit, stands up to 221 degrees Fahrenheit. UL, cULus Listed and CSA Certified. Meets OSHA requirements for outdoor use. Nema 5-15 plug. Yellow. Boxed. Extra heavy, clear molded plugs are rugged, durable and oversized. Super flexible and abrasion resistant. Indicator plug glows when the cord has power. Meets OSHA specifications and UL Listed. Rental. Designed for use in extreme cold weather environments. Cord will stay flexible down to -58 degrees Fahrenheit. Manufactured with Powerlite plug, female end lights when power is on. UL Listed, meets OSHA specifications. Blue. Sleeved. Locking plug keeps tools plugged in. Works with any tool. Abrasion resistant and flexible. Yellow, 15 amp/125 volts. UL Listed. Ultra heavy duty contractor cord with T-blade and lighted locking connector. Oil resistant, water resistant, flame retardant. Stays flexible down to -58 degrees Fahrenheit, stands up to 221 degrees Fahrenheit. 20 amp/125 volt/2500 watt. UL, cULus Listed and CSA Certified. Meets OSHA requirements for outdoor use. Nema 5-20 plug. Yellow. Boxed. T-blade female plug accepts tools with 15 amp, 2 wire, 15 amp, 3 wire and 20 amp, 3 wire plugs. T-blade on female plug only. Meets OSHA standards, UL Listed. Boxed. Designed for hard use. Three outlet, large cap and connector, thick, tough, flexible vinyl jacket. Molded connector is moisture resistant. 10/3 SJTW. 15 amp/125 volt/1875 watts. Meets OSHA specifications, UL Listed for outdoor and indoor use. Boxed. Manufactured with stranded and cabled copper conductors and solid molded plugs for longer life. Outer jacket wont mark floors or walls. SJTW cords resist deterioration from moisture and abrasion. 300 volt wire rating. Sleeved. Enclosure is made of cold rolled 18 gauge steel, legs are made of cold rolled 10 gauge steel. Stackable design allows multiple units to lock together for transport and storage. GFCI and overload protection. 50 amp, 120/240 VAC. Contains (6) WR duplex receptacles, 20A, 125V, (1) locking receptacle 30A, 250V, (1) locking inlet, 50A, 125/250V, and (1) locking outlet, 50A, 125/250V. cETLus listed.